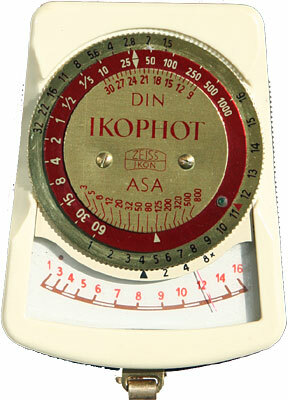 Ikophot was Zeiss/Ikon's name for their hand-held meters; like a lot of companies, they didn't get around to giving them separate model names until later on. This one looks very much like the DeJur 5, though it's a little smoother around the edges and quite a bit younger (note the ASA dial). They both have that distinct trapezoidal shape and finger notches on the sides to make the dial turn a little easier. I've always thought that DeJur probably licensed the design from Zeiss or vice-versa, but I can't prove it. This must have been fairly popular, as Zeiss made a couple versions of it with only minor tweaks. Their Ikophot Rapid was the same thing but used a match-needle instead of a scale. There's also a certain resemblance to the Russian Leningrad. I didn't photograph it here but you can see it here: there's a slide-in incident cover for the cell that normally stays in the middle of the case. The early Leningrads both have that same feature. That makes me think they were all made by the same entity. Since Zeiss/Ikon had been cut in half after World War II, and there was still some cooperation between the two entities until the Cold War really settled in, I tend to think they were designed before the end of the war by Zeiss/Ikon, and manufactured by one side or the other (perhaps both) through the early 60s. I've always thought the Leningrads were East German anyway. And before anyone complains, the color here is actually pretty accurate. Ikophots might have come in different colors, but mine is definitely a sort of buttermilk.